Brooklyn, N.Y. ? As an electric car virgin, I wasn?t quite sure what to expect when Smart let me test-drive the Fortwo Electric on the streets of Brooklyn in June.? For that matter, I had never driven a Smart, nor in Brooklyn so it was going to be a day of many firsts. I thought I should get some exposure to the gas Smart first so I could compare it with the Electric.? With my friend Arv navigating, we headed down the crowded streets in the Smart Fortwo Cabriolet dodging bikes, pedestrians and the dreaded Brooklyn drivers.? The Smart was the perfect city car, allowing us to thread through traffic and around parked delivery trucks.? Before long, I felt like a native hollering at dumb drivers, and shaking my fist out the open convertible top.? Later in the day, Arv even learned some new hand gestures. 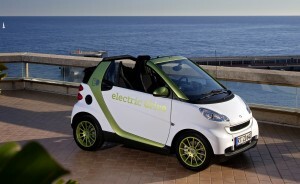 With its upright seating position, the Smart provides a good view of traffic and other obstacles.? The 70-hp, three-cylinder engine is responsive providing plenty of power for this type of driving, but the smartshift transmission has a bit of a learning curve.? It?s an automated manual transmission that can be shifted without using a clutch; in fact, there is no clutch pedal.? The driver can shift manually or leave the transmission in drive and it shifts automatically, but it?s not the smoothest shifts. The Smart accelerates from 0 to 60 mph in 12.8 seconds, it has a top speed of 90 mph and the EPA fuel economy is estimated at 33 mpg city and 41 mpg highway. 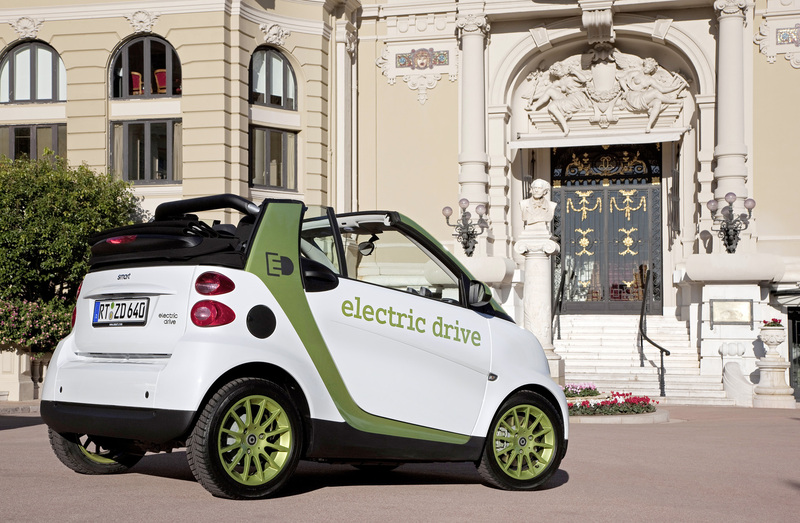 The Fortwo Electric vehicle is a Smart alternative, and was my favorite, at least for city driving. 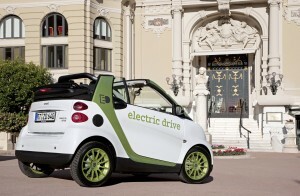 The Electric Fortwo was planned more than 20 years ago when Daimler was developing the original Smart concept.? They envisioned the need for alternate powertrains and factored the integration of electric drive components into the original plan. A 16.5 kW lithium-ion battery powers a 30 kW drive motor.? The battery takes about three and one half hours to charge from 20 to 80 percent capacity and less than eight hours to charge completely using a standard 220V outlet.? The battery can also be charged from a standard 110V household plug, but it does take longer.? The charging is done using a 3.3-kW onboard charger, which meets the recently approved SAE J1772 standardized charging socket specifications. The Electric has a top speed limited to 62 mph, which takes about 15 seconds to reach from zero mph. Turning the key to start the Electric Fortwo does nothing noticeable, but I could hear some electronic clicking and the gauges activated.? 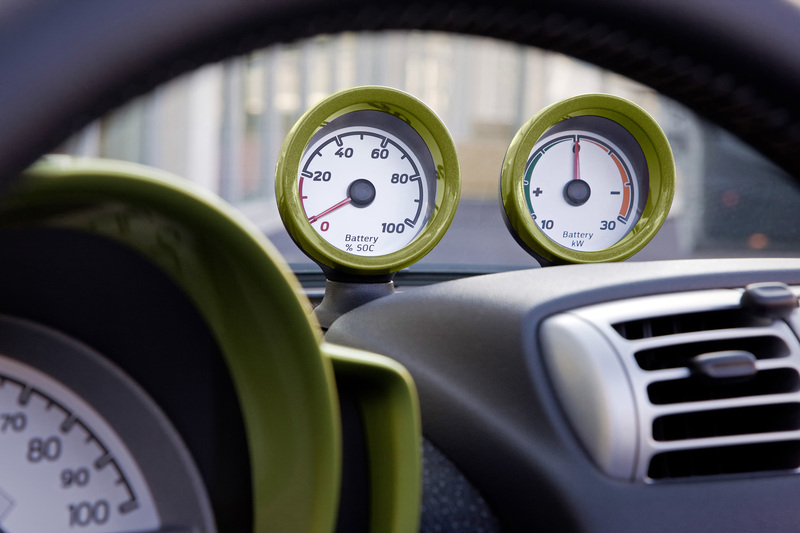 The tachometer and clock, which are in two pods mounted on the dash of the gas powered Smart, are replaced by a battery meter and ammeter that indicates the amount of energy being expended, or generated when the vehicle is slowing or stopping.? The former gas gauge shows the battery level. Pull the shifter into drive, press the accelerator and the Smart goes ? smoothly and quietly.? There is no transmission so there are no strange shifts, and almost no noise other than a slight whine from the engine.? Removing pressure from the accelerator causes the car to slow, with a feeling of mild braking.? It?s so quiet, it was easy to sneak up on pedestrians, but that?s another story. Smart is distributed in the United States through a subsidiary of Penske Automotive Group, Inc.? Plans call for a fleet of 250 Electric Fortwos to be deployed across the country starting this fall.? 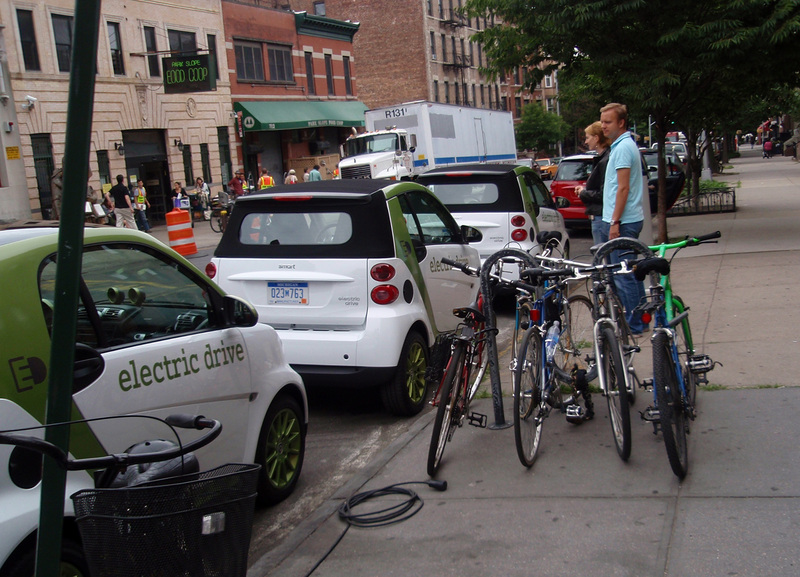 The cars will be placed into cities showing electrification leadership and those with Department of Energy grants.? They will go mostly into fleets of key companies, municipalities and organizations ?making a passionate statement on conservation and environmental awareness.?? Production for private parties is expected to begin in 2012 as a 2013 model year car. For more information visit www.smartusa.com or www.Penskeautomotive.com.